Rajasthan Royals team at SMS stadium in Jaipur. 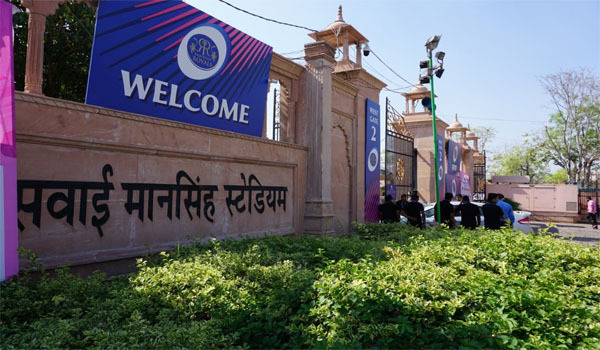 Jaipur: Rajasthan Royals (RR) will play its sixth IPL match on Thursday against Chennai Super Kings (CSK) at their home ground at Sawai Man Singh (SMS) Stadium in Jaipur. The match will start at 8 pm. Royals have struggled in the tournament with just two wins off five matches. They have failed to make the most of home ground advantage as they lost against KKR in their last match on April 7. They won against Royal Challengers Bangalore (RCB) on April 2. Chennai Super kings’s official account posted a video of the welcome on Twitter. Chennai Super kings have won five matches out of six in the IPL 2019 series until now. 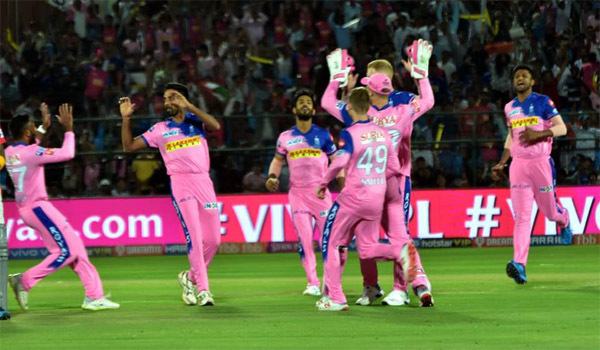 The defending champions have lost just one game so far this season and the defeat came against Mumbai Indians at the Wankhede Stadium. The traffic police officials said that the traffic would be diverted on the roads leading to the venue in the city on Thursday. Traffic will be diverted from JDA circle and Police Memorial. Also, traffic coming from 22 Godam circle to Polo circle will be diverted to Sahakar Marg and Sardar Patel Marg. Vehicles coming from Statue circle will be diverted to Prithviraj T point and Baghdia Bhavan. Traffic going towards SMS Hospital will be diverted to RBI turn, added officials. The officials have made specials arrangements for parking. VIP Vehicles will be parked at South block parking of the stadium. The vehicles coming from the east gate of the stadium will be parked near SMS Investment ground. The vehicles coming from North gate of the stadium will be parked in the ground near Ambedkar Circle and the vehicles coming from the west and south gate of the stadium will be parked at Amrudon Ka Bagh ground. The parking will be prohibited in the area from Ambedkar circle to Assembly, Pankaj Singhvi Marg and Nagar Nigam headquarters. According to Jaipur Police Commissioner Anand Srivastav, the visitors to the match will not be allowed to bring anything except their cell phones.